You can’t explain 382 years in one story. Established in Massachusetts in 1636, the force we now know as the National Guard sustained and protected the infant colonies and eventually helped bring an end to Britain’s colonial rule. Those men weren’t thinking about building the framework of an international force. They just wanted to protect their families from Pequot Indians. Today, they can be found across the globe, providing muscle and resources in Afghanistan and rushing to the aid of their communities at home, just like their predecessors in 1636. This list, was created with the help of National Guard historian Bill Boehm, illustrates how the Guard became the force of citizen soldiers it is today. A depiction of the first muster. All males between the ages of 16 and 60 were required to join one of the Massachusetts Bay Colony’s three regiments upon their establishment Dec. 13, 1636, marking the beginning of the first organized American fighting force. This early version of what would become state militias first mustered in early 1637, drilling once a week and pulling night duty in case of attacks from Native Americans. Massachusetts’ original three regiments are still operating today in the form of the 101st Engineer Battalion, 101st Field Artillery Regiment and the 182nd Infantry Regiment. Want to bring Christmas surprises to deployed National Guard members defending our freedom? Donate today. The Battle of Cowpens was the turning point in the southern campaign. In one of the most notable strategic victories on American soil, a group of 300 Continental Army soldiers and 700 militiamen from North and South Carolina, Georgia and Virginia killed, wounded or captured 900 of the 1,100-man British force it encountered in the Northwestern pastures of South Carolina. American Brigadier General Daniel Morgan’s decision to have militia sharpshooters – modern day Guardsmen – fire on the oncoming British troops inflicted significant casualties at the battle’s outset and forced the British to deploy their reserves. The Americans’ apparent retreat after the initial volleys drew the pursuing British, who were then funneled into a trap by the American cavalry where they then faced off with the Continental Army. When the British moved to retreat, some militia members who’d stuck around attacked again. A pair of militias fighting under the Union flag proved crucial to holding off the Confederacy during the Battle of Gettysburg, ending Confederate General Robert E. Lee’s northern invasion and turning the tide in the Civil War. The First Minnesota Infantry plugged a hole in the Union line on July 2 that would have been fatal had it been exploited by the Confederates. The regiment’s now-legendary bravery kept the Union shape in tact, but resulted in the deaths of 215 of the First Minnesota’s 262 men that day. Also on July 2, the 20th Maine Infantry preformed one of the more significant feats of the Civil War. Holding down the far left flank of the Union line, the Mainers fended off six charges from a pair of Alabama regiments. 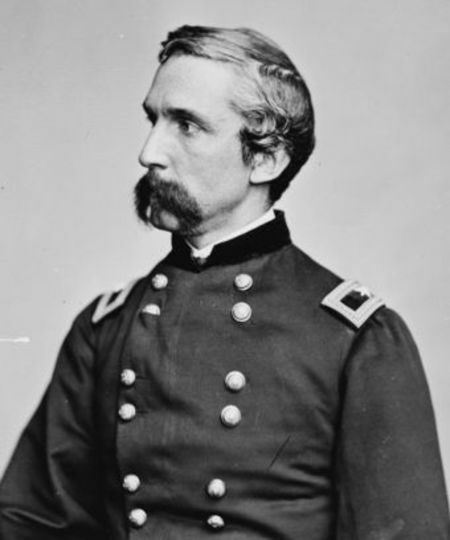 Knowing his men didn’t have the firepower to withstand a seventh engagement, 20th Maine Colonel Joshua L. Chamberlain ordered a bayonet charge down Little Round Top that caught the Confederates by surprise, ending the threat to the Union flank. Chamberlain was elected as Maine’s governor in 1866 and awarded the Medal of Honor for his Gettysburg actions in 1893. Teddy Roosevelt and his band of Rough Riders. Then-Assistant Secretary of the Navy Theodore Roosevelt resigned his post in 1898 to concentrate on building a fighting force for the impending war with Spain. His Rough Riders — a volunteer force comprised of men from all walks of life under the flag of the First New Mexico Cavalry — entered federal service as the First U.S. Volunteer Cavalry and traveled to Cuba to fight the Spanish. On July 1, the Rough Riders (who were more infantry than cavalry, as they arrived in Cuba without horses), overran several enemy positions in the Battle of San Juan Hill. The Spanish gave up the fight two weeks later. Roosevelt’s efforts catapulted him national prominence, culminating in his ascendance to the American presidency in 1901. 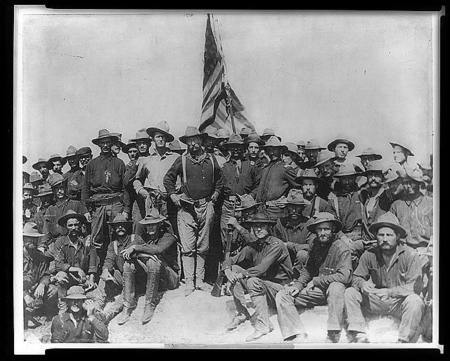 A 1916 raid by Mexican rebels against an Army garrison in New Mexico led to the federalization of the National Guard of Arizona, New Mexico and Texas. By June, thousands more Guard troops had been called up to serve along a swath of border stretching from Arizona to Texas. The massive mobilization proved to be a valuable experience two years later, when many of the same Guardsmen were deployed overseas to fight in World War I. 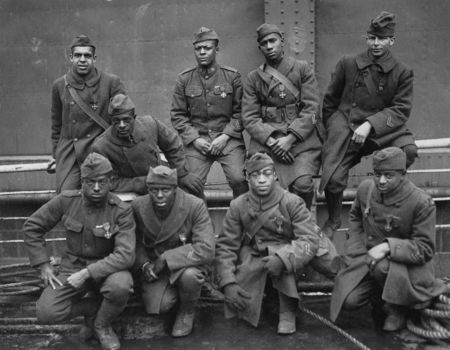 Members of the Harlem Hellfighters in 1919. America entered World War I in 1917. A year later, a pair of historic Guard stories unfolded on the fields of Europe. Harry S Truman — then a Captain in the Missouri National Guard — was part of the combat debut of the U.S. First Army in May 1918 in Argonne, France, which led to significant Allied gains. Truman became president of the United States in 1945. Later that fall, Harlem’s “Hell Fighters” proved their mettle. The 15th New York Regiment—rebranded the 369th Infantry Regiment upon their arrival in Europe—was an assembly of black Guardsmen who fought valiantly in the Meuse-Argonne offensive. The entire regiment of “Hell Fighters” was awarded France’s Croix de Guerre for their heroism. The echoes of World War II across the Atlantic Ocean led President Franklin D. Roosevelt to call up the National Guard for a full year of training. The federalization of the Guard doubled the size of America’s active duty forces. That, combined with the institution of America’s first peacetime draft, provided the manpower for America’s eventual intervention in Europe. Guard units participated in a series of battlefield exercises over the next few years, including the Louisiana Maneuvers, which allowed America’s military brain trust to correct tactical flaws before joining the fight against Axis powers. Members of the Vermont National Guard in 2010. As the Vietnam War drew to a close, the Department of Defense switched to a Total Force policy, mandating that National Guard and Reserve troops deploy in both support and combat roles alongside their active duty counterparts future American conflicts. This approach was tested at the outset of the 1991 Gulf War with successful returns. The eventual downsizing of the Army led to a greater reliance on the Guard and Reserve forces in conflicts and humanitarian missions. Four years after the 9/11 attacks, Hurricane Katrina brought devastation to America’s Gulf Coast, creating an unprecedented worldwide need for Guardsmen. The storm could not have come at a worse time for America’s citizen-soldier force, as more than 79,000 Guardsmen were federalized to support the Iraq and Afghan Wars when Katrina hit. Still, more than 51,000 Guardsmen from across the country quickly deployed to Louisiana and Mississippi to provide humanitarian relief, distributing supplies, evacuating residents and stepping into law enforcement roles. A version of this story first appeared on USO.org in 2015 and in the Summer 2012 issue of On Patrol, the USO’s former magazine.